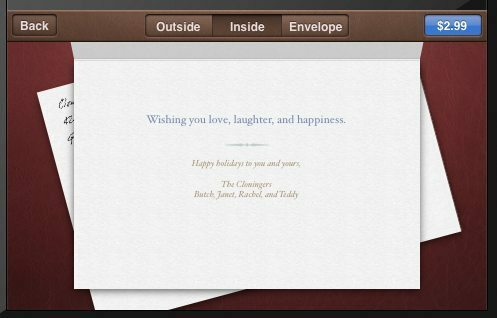 One of the products Apple discussed in their recent iOS 5 announcements was an app that lets you custom-design a greeting card that Apple will print and snail-mail for you. I thought this seemed like a great idea for me; I like to send greeting cards to my friends and family but don’t like to go to card shops to find them. I’ve tried using various programs to make cards myself, but they always had a “home-made” look, not the nice custom look I wanted. 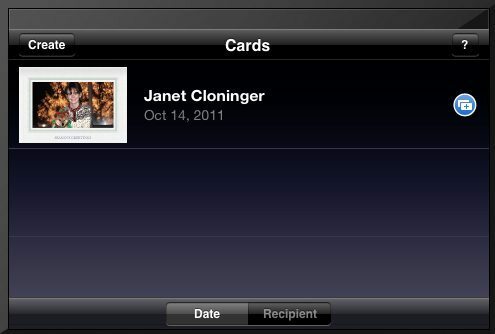 I was really excited to try the Apple Cards app, and I downloaded it to my iPad 2 the moment it was upgraded to iOS 5. Anyway, the Cards software ran well on my iPad 2 – in that ugly little window in the middle of the screen. When you first start up the app, you’ll be told that Apple wants to use your current location. I’m not sure why they need this information. They also want to send you push notifications, supposedly to let you know the status of your card’s printing and delivery. Apple says their cards are created using a combination of digital printing with a “centuries-old printing method called letterpress,” which is a method of embossing a design into the paper as ink is added. Letterpress is used for the borders and the decorations on the front of the card. 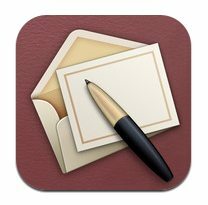 Apple also says they use ultrapremium cotton paper for their cards. All this sounds nice, and it should lend a “hand-made” instead of “home-made” look to the cards. Creating a card is simple. You first select a category by tapping one of the icons at the bottom of the screen: Thank You, Holiday, Baby, Birthday, Love, or Travel. I’m thinking about using this to send my Christmas cards this year, so I chose Holidays and found a style I liked. This card will be my trial run. As you browse the styles, you’ll notice that all the current styles are landscape designs. I hope Apple reconsiders this and adds some portrait styles soon. You customize the outside and inside of the card. 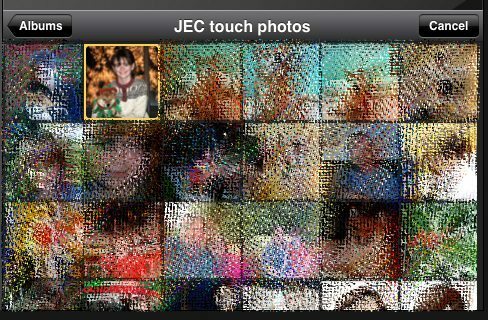 I started with the photo on the outside by clicking in the photo area. 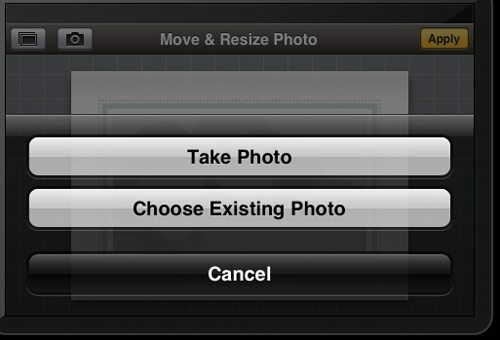 You can snap a photo using the camera or you can choose a photo from your existing albums. (Perhaps the camera option is why they tried to ignore the iPad. 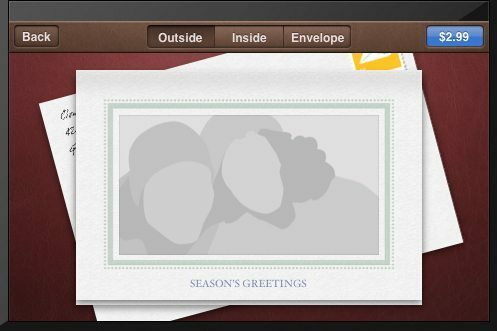 They don’t want the recipient blaming the grainy photo on the printing process instead of blaming the crappy cameras in the iPad 2.) Of course, the option to take a picture is great when you want to send travel photos. You see a beautiful view, snap a picture, and send it to loved ones at home in just a couple of minutes. 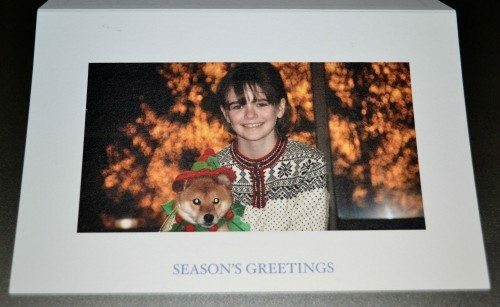 I wasn’t ready to take a new Christmas picture, so I chose an old Christmas picture for my trial card. You won’t be able to choose an existing picture unless you enable location services. I don’t like this. Apple says they include the location the photo was taken for travel cards. I can maybe understand that, but they also include any GPS information stored with every picture in any card. The photo I used was an old one without any GPS data, so nothing showed up on my card. I don’t understand why everyone on my Christmas card list needs to know the exact location I took my card photo. You can move the picture around and center it in the photo area. You can also zoom in on a section, but you can’t zoom out. Once your picture is to your liking, tap the Apply button in the upper right. You can modify any text on the outside, too. Just tap the text to start editing. I didn’t see a way to change the font or text color. I also couldn’t change the border design. 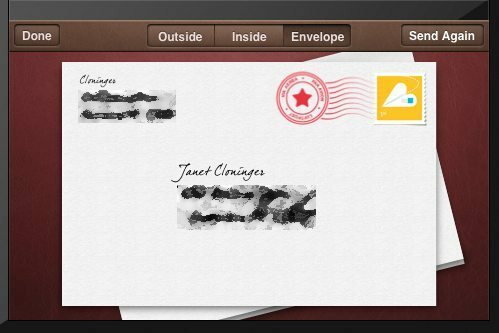 Click the Inside button to customize the interior of the card. 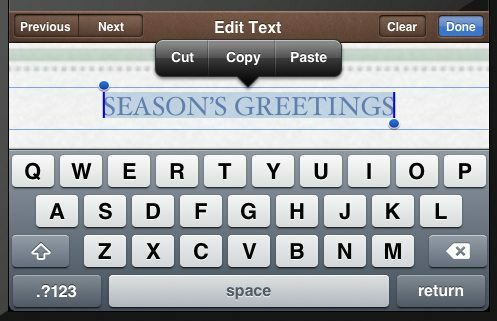 You can change any of the text in the greeting or signature. You can’t change the design elements, like that flourish above the signature section of the card. Once the inside is to your liking, tap on the Envelope button to address the card. Tap in the return address area to enter your address. You can type it in or choose it from your contacts. You can edit the address as you need; I removed my first name from the return address. (You’ll have to pardon the black scribbles in the screen shot. I obscured my personal information.) Select the recipients address from contacts or type it in. I took the screen shot above after I had completed the ordering process, so the button at the upper right says Send Again. During the initial design process, the button is green and says $2.99 when you’ve just finished entering the addresses for a new card. That price is for mailing a card within the US. The price for mailing internationally is $4.99, and I imagine the green button would reflect that price if either of the addresses were outside the US. Tap the price button and it changes to a BUY button. Tap Buy to continue to purchasing the card. I’ve already listed a few complaints, but now’s where I ran into my biggest dislike. I don’t keep a credit card on file with my iTunes account and rely on iTunes cards for two reasons. The first is for security – remember a couple of years ago or so when Apple admitted that some of the credit card info in their accounts had been compromised? I removed my card info then. The second reason is that iTunes cards are a good way to budget my purchases and not end up with a heart-stopping credit card bill at the end of the month. I couldn’t purchase my greeting card because it requires a credit card! Why? If I’ve redeemed an iTunes card, Apple already has my money and can send the 40 cents to the Post Office from that balance. To checkout and send a card, you must have a Visa, MasterCard, or American Express associated with your account. I was determined to complete my review, so I entered a card with my account and tried to send the card again. To complete the purchase, I had to login to my iTunes account and had to supply my CVV code as part of the checkout procedure. Note that the purchase price includes the custom card and the appropriate postage. Sales tax, if mailed from within the US, or VAT, if mailed outside the US, will be added to your purchase price. Luckily, your completed card designs are saved with your iTunes account. This made it easy when I had to quit the process and store a credit card. It also makes it possible to send the same card to multiple recipients. 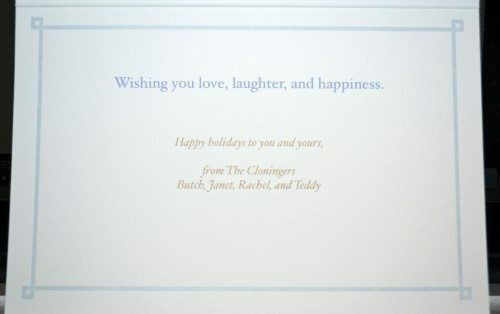 If I wanted to send this card to my entire Christmas card list, I’d have to enter an address and checkout for each card. You can’t do a mail merge and batch checkout, at least not that I found. I designed and purchased the card on 10/14. I got an email at the address associated with my iTunes account on 10/14 saying my order had been received. I got another email on 10/15 saying the card had been shipped. Although my card was delivered to my house on 10/18, I haven’t received a delivery-notification email yet. I didn’t receive any notifications on my iPad about the card status, either. I thought the entire point of using the USPS Intelligent Delivery barcode was to let the sender know when their card had been delivered to the recipient. Click on any pictures of the actual card for much greater detail. 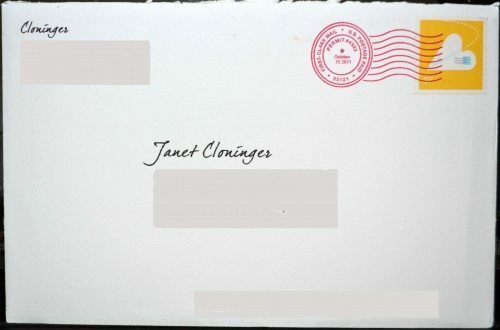 The photo is of my actual card envelope. Sorry, but I had to obscure all personal information, including the barcode. The long, grayish box at the bottom of the envelope is where the barcode appears. Notice the yellow stamp designed by Apple for these cards. At first, I thought the design was a heart-shaped mouse with a dotted-line cord. Closer inspection shows it’s a heart-shaped paper airplane with a postage stamp on it. Click the picture for a much larger view, and you’ll be able to see the stamp better. You’ll also be able to see the texture of the paper used for the envelope. The envelope is very thick and heavy. This is stationery, not those cheap, thin envelopes I mail my bill payments in. It’s not a bright white color, more like a very light cream color. I was a bit disappointed when I opened up the envelope. You’ll notice that my actual card doesn’t have the green border shown on the design I selected. Although the photo is printed beautifully, the missing border drops the card a couple of notches toward the “home-made” side in my eyes. The card stock is heavy and thick, though. 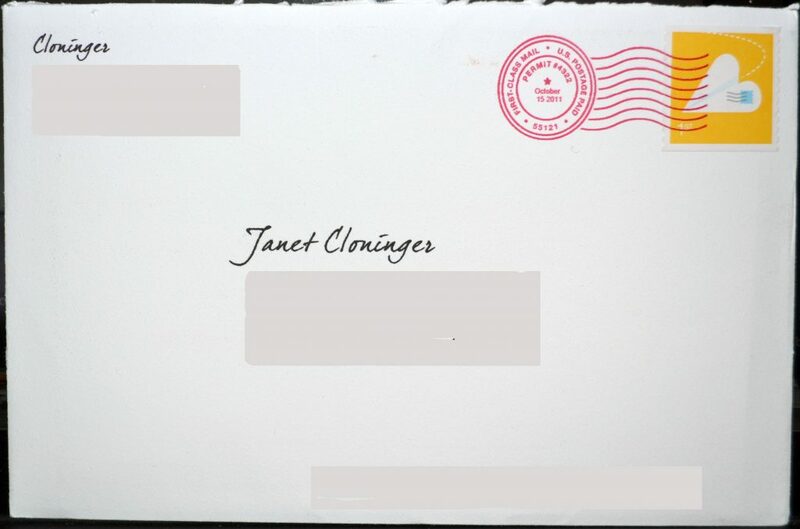 It’s the same cream color as the envelope, and it has a rough texture that I thought might interfere with printing the photo. My photograph doesn’t show it as well as I had hoped, but the photo printing is very sharp, clean, and clear. The color reproduction is very true. It’s clear enough that I can see that the small designs on the body of Rachel’s sweater are black hearts. I can even see the stitching on the holly leaves around Teddy’s neck. The “Season’s Greetings” underneath the photo is sharp and clear, too. The greeting is just printed on with no embossing. I suppose only the border – had I gotten the one I selected – would have been embossed with the letterpress process. The interior of the card has an embossed border not shown in my selected design. It does not have the flourish between the greeting and signature that was shown in my selected design. Why bother letting me select a card design if you don’t plan to use it? You can feel and see the embossing on the interior of the card, but you don’t see it on the outside back (which is completely blank). You can almost see the dimensionality of the border in the above photograph. The printing is nice and sharp. Again, the words are printed but not embossed. In addition to the things I’ve already mentioned – including GPS info in the card, requiring a credit card to purchase, and the missing design elements on my card – I have a couple of other complaints. I don’t like that all the cards have basically the same style and the same fonts and text colors. The borders all have a similar look, whether you’re announcing a new baby or wishing someone a happy holiday season. I think this is because of the minimal design aesthetic so inherent in everything Apple does. I love the design of their products, but I want a little color on my greeting cards. I want some red and green on my Christmas card, and I’d like a holly or evergreen border, too. Baby cards need some pink and yellow, not just blue and green. Not every border needs to be done in that pale grayish-blue. 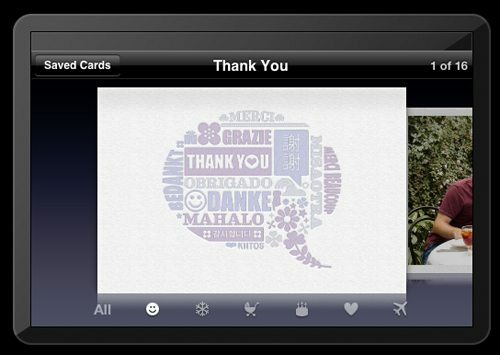 If Apple truly wants to allow us to customize our cards, they need to loosen up the design constraints a bit. They also need to add portrait-orientation cards, too. After all, allowing me to tart up my card the way I like it isn’t going to tarnish Apple’s reputation. If Apple would just allow us more choice in how we design the cards – and actually print that design on the card, I’d be more excited about this app. I think the pricing is great. I couldn’t go to a card shop and buy a card of that quality and put postage on it for less than Apple charges to custom-print and mail the card for me. The design process is easy to use, and the checkout process is easy once you get a credit card in your account. 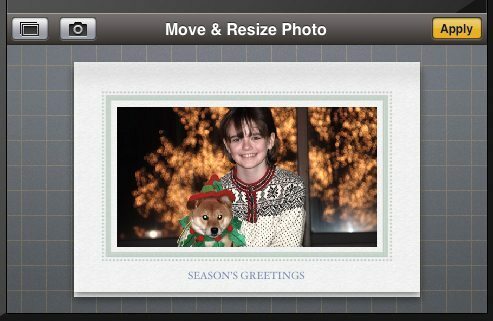 This could become my go-to method of sending greeting cards if Apple would let me have a little more control so that all my cards don’t look like I only have two crayons in my box of Crayolas. Apple Cards iPhone / iPod App Review originally appeared on The Gadgeteer on October 20, 2011 at 8:00 am.